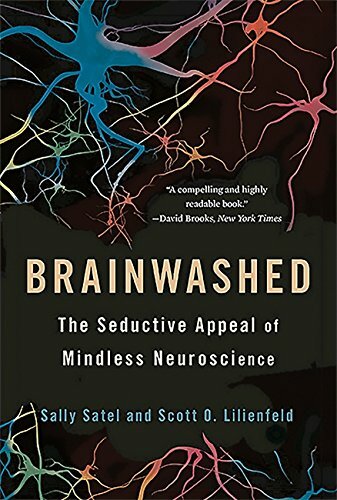 Reading Brainwashed: The Seductive Appeal of Mindless Neuroscience is a bit like reading one really long college research paper—which isn’t necessarily a bad thing. What Dr. Satel and Dr. Lileinfeld are proclaiming in Brainwashed is that science is behind the application of said science; that science being, namely: functional magnetic resonance imaging (fMRI). Due to the pretty pictures produced by fMRI and the apparent human need to apply hard facts to things that are (and perhaps should remain) inexplicable, this relatively new technology is being abused and misused. The advertising industry, political strategists, potential employers, drug treatment facilities, criminal prosecutors, and defense attorneys are all turning to this new technology with the hopes of breaking down human behavior to simple and precise interpretations of brain scans. Throughout Brainwashed there are many cited examples of how the application of this technology affected or potentially affected the legal outcomes of tragic human stories: the brutal murder of Shirley Ann Crook by two teens, the drowning of her children by Andrea Yates, the case of psychopath Brain Dugan. . . . The use of neural patterns in consumer preference is also well documented with examples such as the Coke-Pepsi challenge, the claim by Apple that “the brains of Apple product users show neural patterns identical to those displayed by the brains of devoted Christians viewing a religious figure or icon,” and the use of fMRI to predict commercial success of new songs by neuroscientists. • Companies such as No Lie MRI and Cephos Corporation, charge $5000 to $10,000 to private individuals to undergo fMRI lie detection. • Google, Facebook, Motorola, Unilever, and Disney have hired neuromarketing companies like NeuroFocus, SalesBrain, Neuroco, and FKF Appied Research at a cost of around $40,000 to $50,000. • It can cost $50,000 to $100,000 to conduct one fMRI research study. • Depending on the type, fMRI machines cost between $1,000,000 and $1,500,000 USD. Drs. Satel and Lileinfeld provide ample and compelling evidence to the contrary. Drs. Satel and Lilienfield have peppered this text with just enough human stories and what makes us human to prevent ODing on this vast accumulation of research facts, making Brainwashed a solid and worthwhile review of the dangers of applied neuroscience.